January is National Hot Tea month and a great time for tea drinkers and non-tea drinkers alike to branch out and taste something new. If you are a novice tea drinker I suggest starting with one of the four most popular types: black, green, white and herbal. I tend to like white teas for their delicate subtle floral taste, and green teas for their sweet herbaceous flavor. That's not to say that I don't drink and enjoy other varieties. One of the things I like most about drinking tea is that there are so many options, making it fun to experiment. An important thing I've learned is that properly storing tea leaves is a necessity to keep them tasting fresh. Tea leaves are porous and tend to absorb moisture and nearby aromas. The best way to store them in between uses is inside an airtight container kept in a dry, cool and dark place. I've recently partnered with Rishi Tea, a state of the art tea distributor based out of Milwaukee, to learn more about their teas and storage options. According to Rishi green and white teas, tend to lose their freshness most quickly so it is even more important to store them correctly. Rishi offers wonderful tins that are a balance of both beauty and function. They not only protect tea from the elements but are also decorative and perfect for displaying on your counter or office desk. In an effort to get more people drinking tea Rishi is generously offering 5 lucky Food Hunter's Guide Readers a chance to win a sample pack of teas along with two beautiful storage tins. I love my tea! That's such a pretty tin! As a tea drinker, this post has great information. I would like to try more loose teas and white teas, since I tend to drink black and green most often. Great post! I had no idea it was National Tea Month...and our family drinks tea all of the time. I love those Rishi tins, they are beautiful. I mostly drink oolong and green teas, which I adore. I've been drinking hot tea almost every day the past two months. It's so comforting! I keep my bags in a drawer, but that's an excellent storage tip for loose leaf tea. i'm a total tea lover! I drink it like 4 times a day! I hadn't heard of Rishi Tea before (and I used to live in Milwaukee!!) - shame on me. 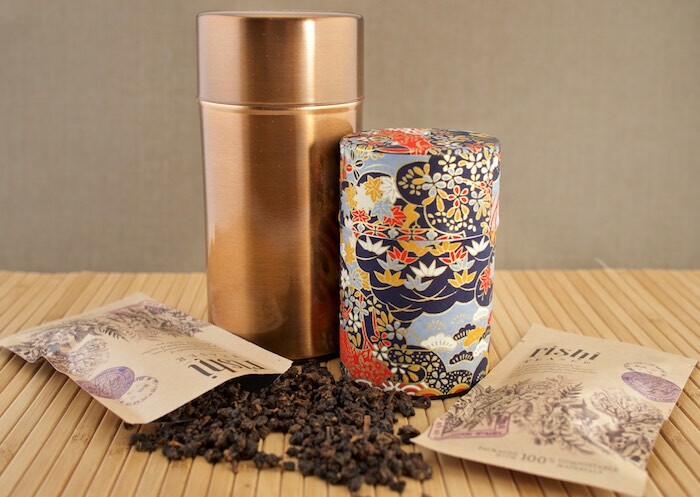 I love experimenting with new loose leaf teas, and those tins are beautiful. I didn't know it was tea month! How fun. I love tea, and since I'm not a coffee drinker it's my go to. Wow! Beautiful! I don't drink much tea but maybe if it looked this good I would drink it more often! Wow! Another fun giveaway! Awesome. I love the copper! Such a sleek little thing! Great idea for a giveaway; we love our tea!!! I have really been getting into tea lately, but I had no idea about proper storage! These tins are so cute! These are beautiful! I am a big fan of white tea, too. My Chinese Medicine doctor recommended it to me years ago to help me with my headaches. Someone just gave me some rishi to try. great giveaway. How fun! I had not idea that January was National Hot Tea Month. So fun! My favorite is herbal blends. Great tips for storage too. I like tea but have never heard of this, will have to check it out! I grow tea leaves. Using a tin is the closest thing to vacuum sealing tea. It keeps the light out and most of the air. It is best to keep the tea in a cool place as well. I love their name as well. I didn't know about them. checked out their tea and some really nice accessories!